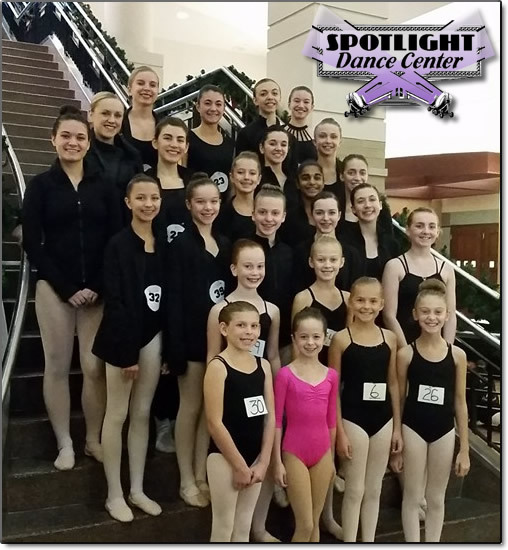 Owner and Director of Spotlight, Wendy has over 26 years of experience teaching dance to all ages. She trained in Ballet, Pointe, Tap and Jazz and competed in regional and national dance competitions. Her formal training was with Iacob Lascu at the Lascu School of Ballet. Ballet performances include “The Sleeping Beauty” and Detroit Symphony Orchestra’s “Nutcracker.” Wendy also taught the Clarkston Youth Enrichment Dance program for 3 years. Her competitive students have trained regionally and nationally with many well-known choreographers and performers, have been well-recognized at conventions/competitions and have won numerous overall awards and choreography awards. She is certified to teach by examination through Dance Masters of Michigan and Dance Masters of America, of which she is an active member. Stephanie has over 27 years of dance experience in ballet, pointe, tap, jazz and lyrical. She has experience as a competitive dancer and has attended many dance workshops and conventions. Stephanie has also studied and completed grades one through four in Cechetti method. She is co-director for Spotlight’s Competitive Company, and her students and choreography have been well recognized in many competitions. This is her 17th year at Spotlight Dance Center. Stephanie is certified to teach through Dance Masters of Michigan and Dance Masters of America. Adria started dancing at age 6 and has continued through high school and college. She has experience in ballet, jazz, tap, kick line, lyrical, pom and hip-hop, and was on her high school dance team. Although she graduated from Oakland University with a degree in Industrial Engineering, whenever there was room in her schedule, she managed to squeeze in university dance classes. She started teaching young ballet classes in 2003. She has taught ballet at the Lakeland Ice Arena for the Jr. Team Du Coeur ice skating team for 2 years. She was also the JV dance coach at Waterford Mott High School. Adria is thrilled to teach at Spotlight this year. No matter where life takes her, she can’t seem to stop dancing. Raquel has over 34 years dance experience in ballet, jazz and tap. She has been teaching for the past 28 years. She is a certified Cechetti instructor and has also studied the Russian style of ballet. She has performed for the Flint Ballet Theater and has taken top places in many competitions on both the regional and national levels. Loving the art of dance in all of its forms, it is Raquel’s desire to inspire that love in her students. Why walk when you can dance? She is certified to teach by examination through Dance Masters of Michigan and Dance Masters of America. A former student and Competitive Company member of Spotlight Dance Center, Bri has been dancing since the age of 3. Throughout her dance experience she has studied a variety of dance styles including: ballet, pointe, tap, jazz, lyrical, contemporary and hip-hop. While studying Special Education at Michigan State University, Bri was a member of the MSU Orchesis Dance Company, a modern and contemporary based organization. Bri is excited to be back at Spotlight Dance Center teaching kids such a wonderful art form, as well as joining SDC’s Competitive Company as a choreographer and instructor. Gabriella was a student at Spotlight for 9 years and was on the competition team for 6 years. She was also a teacher’s assistant for 5 years prior to teaching. This is her third year teaching at the studio. She is currently a double major at Oakland University, pursuing her degrees in dance and elementary education. She has trained in all styles of dance under many teachers and choreographers, including the Rockettes Summer Intensive in New York City for two years in a row. Gabriella also choreographs for the musicals at Clarkston High School. She is so excited to share her passion and love with her students! Lauren is a former Company member and instructor at Spotlight Dance Center, studying ballet, lyrical, tap and jazz since the age of 4. She continued dancing in college as a member of Michigan State University Orchesis Dance Company from 2010-2013. After graduating with a Master’s degree in Speech-Language Pathology, Lauren became a Yoga Alliance certified 200-hour Registered Yoga Teacher. She is excited to return to Spotlight to teach yoga and share the physical and mental benefits of linking breath with movement. A former dancer for Spotlight Dance Center, Alyx began her career of dancing at age 3. Alyx is currently enrolled at Oakland University in her junior year. She aspires to gain three degrees (Elementary Education, Dance, and Dance Education) while she is at Oakland. While there she has taken class with many trained professionals. She has trained in dance styles such as Ballet, Pointe, Jazz, Lyrical, Contemporary, Modern, Tap, Hip-Hop, Poms, and Partnering. Alyx also attended a Rockettes Summer Intensive in New York in the summer of 2013. She is excited to be back at Spotlight as a teacher and choreographer for both the recreational and competitive team here at Spotlight. Devin has been dancing for 25 years. She has trained in tap, jazz, ballet, hip-hop, modern, and many other styles. Devin has been teaching students of all ages for 10 years. She has a wonderful husband and beautiful 2-year-old at home, who she spends most of her free time with. She received her Bachelor’s of Science in exercise science from Saginaw Valley State University where she was a part of their college dance team. She also works as an exercise physiologist at McLaren when she’s not teaching dance. Dance has always been her passion and she can’t wait to share it with the Spotlight family this year! Meredith has 9 years experience in ballet, tap, jazz, hip-hop, modern and is a licensed Zumba instructor. She has been a teacher’s assistant for 3 years and was on her studio’s competition team, participating in many competitions and conventions. She is majoring in dance and social work and is excited to teach this year!